The original member of the ruling triumvirate (the other two being TFX and F-14 Fleet Defender, also on this site), and a definite triumph of content over style. Ok boys and girls, this sim is as realistic as they came in ’93. You’ll fly either the IDS or ADV variants of the Tornado, in several campaigns. The original included three European theatres (not real locations, I’m afraid), but the expansion disk brought with it the Iraqi desert. The ADV apparently is only flyable in single mission or multiplayer (yes, this is one of the first multiplayer capable flight sims), while the campaign revolves around the IDS, with all the campaign missions being ground attack ones. The Tornado is a mighty beast, able to fly at over Mach 1 at a constant altitude of 200 ft on autopilot. Once you get to the objective, there’s a lot of munitions to do the work, all British in origin. The enemy can be turned off (you're in for an easy ride) or on (you're buggered). They’ll fight back, and avoiding enemy aircraft is really hard. The campaign game has the added benefit of being fully dynamic. It ends when you have pushed the enemy from their positions and off the theatre map. Flight modelling is top-notch, even if the avionics modelling isn’t totally realistic (some minor gripes with a few things). Even so, laser bombing runs are very good fun, as is dodging AAA on your way to a C&C bunker at 200 ft, and you’ll lose hours with one of the best mission planners ever. 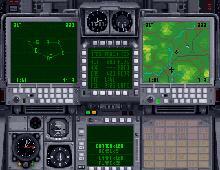 Graphics are VGA resolution, totally polygonal, and very clear, but the menus use SVGA at 640x480 to good effect. Sound Blaster is supported, as well as MT-32 and Adlib. This is a game that every serious simmer should have on his shelf (or even better, on his hard drive), as it is one of the best flight sims ever made. There is nothing really like this game nowadays, but there are rumors that a Tornado II will be coming after the Command edition of Digital Integration’s Super Hornet. Underdogs note: Check out the review and the two fan sites listed below, especially the new extremely devoted, extremely comprehensive one created by Frankie Kam. You are not to play the game without it! I highly recommend putting aside an hour just to take in all of what's on offer. The Olpes site also has a good deal of information including hints on getting started. "I have two more Tornado resources to share with you. The abbreviated 74-page manual for DI's Tornado is here. Maybe it will be a useful addition to the Tornado entry. The actual English hardcopy manual has 323 pages, and in the whole Internet there is only one 333-page PDF that exists, but it is a French version (unfortunately, no English version PDF exists)!